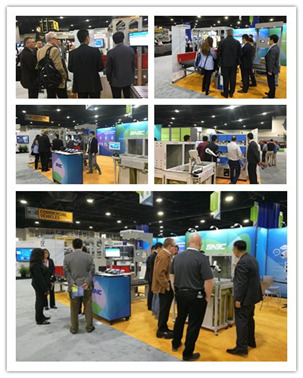 On April 9th-12th, 2018, the biennial MODEX Atlanta World Logistics Exhibition was grandly opened at the Georgia World Congress Center. SNBC, a provider of smart equipment and solution, participated in the event with a new logistics industry solution. 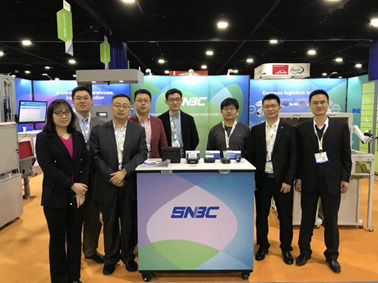 During the exhibition, SNBC took the express delivery solution and e-commerce warehousing solutions as the main line, exhibiting diversified integrated solutions covering information, automation and terminal distribution. 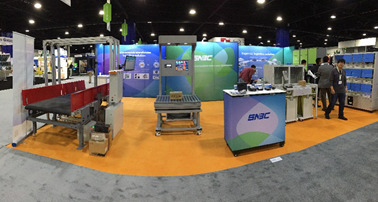 At the exhibition site, the logistics products and solutions of SNBC stand out among many similar companies by virtue of their excellent quality and attractiveness, attracting customers from all over the world to experience and consulting. Among, SNBC dynamic weighting machine BWM-D1000 is able to adapt to various light environments and accurately measure abnormal parts and other powerful features. It surpasses similar products in terms of technology level, product quality, and user experience, and becomes a star product that customers are constantly asking about. SNBC can tailor the intelligent logistics industry solutions for our customers by creating "intelligent wings for the customer's business success," to create value for customers and achieve a win-win situation!